“WS Power Generation System” that uses natural energy sources. 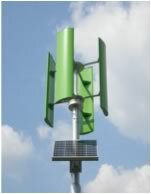 “WS” stands for “wind and solar.” Power generated using these forms of energy is safe for everyone and the places in which the system is used, as it supplies energy in a gentle, environment-friendly way. Auxiliary power source, emergency power source, park security lights, aid for teaching about ecological power generation, antitheft monitoring system for agricultural products, etc.